Miguel, I see Pax Prime has updated their site to reflect the days and schedules...I won't be going (a shame, I could take the day off from work and ride a bus to downtown, too, but all the tickets are supposedly out), but I will be anxiously watching twitter and news feeds for anything coming from you (IIRC you said in one of the dev interview vids you'll be there? on a panel? ), so which day/section will you be part of? I am trying to find a way to do a stunt to steal the show right now from them... but chuttt!!! its a secret! On another topic...... Dear Crusaders, I will release news tomorrow that, I hope, will get your drooling!!! Tomorrow as in 12:01 am tomorrow? I hope so. My body is ready, come at me news. look really promising. i'm impressed. Please vote honestly, dont hype if you dont believe in the Imperium! can we have alpha/beta now? Huh, surprised that Star Citizen is so high inthe rankings. So, Miguel, this is 1k players in a single area within the world, right? What kinds of numbers are you looking to accomodate on a server, total? Why? It looks extremely promising. Usually it's the generic and boring wow ripoffs that get the most hype. Also I saw a person get on my bus who was a spit of miguel and was kind of wierded out that I thought miguel was in liverpool on the bus from town, really made my brain frazzle. they said "imagine planet side 2 and multiply it with 10"
That got thrown around in the early interviews, but from a technical standpoint, it could be more or less depending on how in-game testing turns out. Yep. Sorry Crusaders, I clic the wrong ''quote'' button! The Much Different Behaviour Announcement (hehe!! yes, pun intended) is way bigger than some of you understood. Its NOT about servers (we will have single server tech as well) but about THE SAME BATTLE. Like I said, Imagine you and 499 other facing 500 Orks (players) that start screaming and running, shooting towards you and your friends..... add tons of vehicles shooting and artillery from your fortress. And that is only one battle in one of many continent on the planet. Like I said many times before. I dont want to be jack of all trade. Eternal Crusade will be the BEST Massive Warfare game. I am EVER present, EVER watching!! Reason begets doubt; Doubt begets heresy. Thought so! That's what I've been posting online everywhere - that I'm fairly sure it means in one given location. How long are you going to stay in Seattle? Just for the day you're on the panel, or will you visit the Needle, or the waterfront, or maybe even stay for a football game? haha nice how patrick dont want to say "yes you are right its unity"
Interesting. 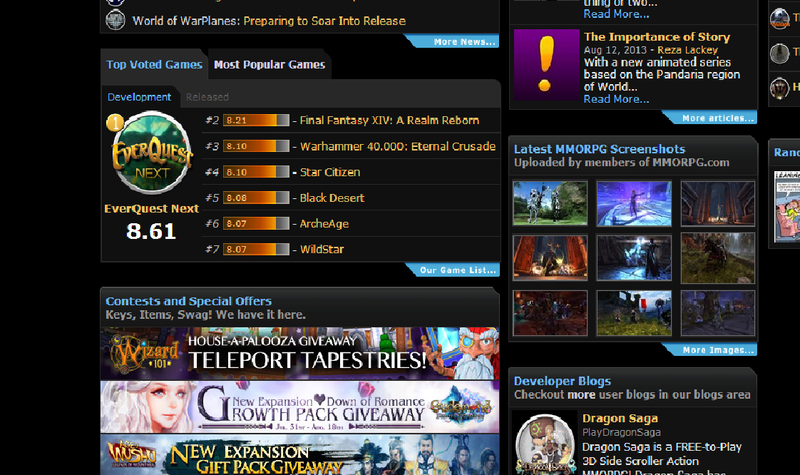 Looks like your company has some good marketing strategies, if it has two games in the top five most hyped MMOs list. Unity will be an interesting choice. Haven't been a ton of games that've used it, and most that have are indie-developed games. I don't think I've seen a full-on Unity non-indie developed game ever, so it'll be really interesting to see how the gameplay of Space Marine can mesh with the mechanics of Unity. Sounds awesome but this will surely mean the game will require very high end PCs? Not really. A decent internet connection, but if the game is well-optimized for multi-core CPUs, which most are nowadays, then it won't really be a problem. That seems to be the case indeed. And although I hate to admit it, a lot depends on good marketing. While I understand if you cannot say if they will be in the final game, but has a Harlequin class for the Eldar been considered? A game that has done the band of the biggest badasses in the galaxy justice has been a dream of mine for almost the entire time I've known the 40K lore. I just wonder if my "hopefully-soon-to-be" Oculus will work with Eternal Crusade. Apparently it fully supports everything that Unity has to offer. How would that be: third person perspective through VR. Miguel? Does anybody from the team plays with this googles?